Bombardier has faced a series of problems over the plane, most recently a trade dispute in the US that imposed a 300% import tariff. Bombardier's Northern Ireland's director Michael Ryan said the deal was "great news" for the Belfast operation. About 1,000 staff work on the C-Series at a purpose-built factory in Belfast, mostly making the plane's wings. Airbus and Bombardier's chief executives said the deal - which will see Airbus take a 50.01% stake - would help to boost sales. The deal also gives Airbus the right to buy full control of the C-Series project in 2023. Why is Bombardier important to Northern Ireland? Experts have hailed the deal as hugely significant and described it as akin to a supervolcano exploding in the aviation world. BBC Northern Ireland's business and economics editor John Campbell said Airbus had effectively taken control of the C-Series project in a transformational deal. 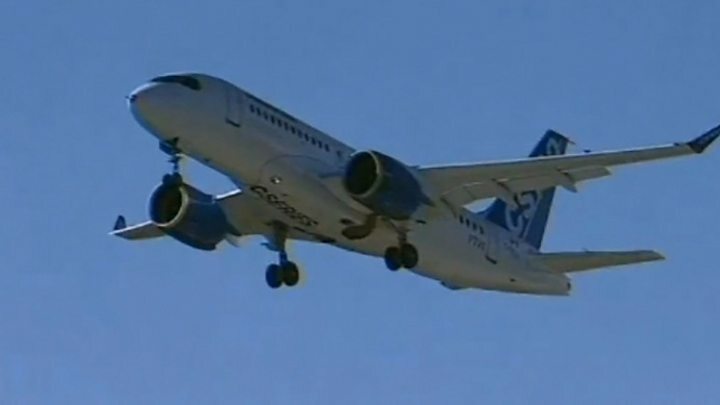 He said it would use its financial muscle in procurement and sales, while Bombardier's manufacturing operations would continue to build the planes. It's perhaps symptomatic of the difficulties the C-Series has faced that Airbus will not have to hand over any cash for its 50% stake. The hope will be that Airbus' financial muscle will finally put an end to those difficulties. In particular, Airbus thinks it can solve the C-Series tariff problem by assembling the plane for US customers inside the US at its factory in Alabama. But, as trade expert Simon Lester of the Cato Institute pointed out to me, it may not be that straightforward. That's because of something known as "trade circumvention" - in crude terms, when a company tries to avoid tariffs by superficially changing the country of origin of its products. Will the US trade authorities (and Boeing) see an Alabama-assembled C-Series as an attempt at circumvention? Davy Thompson, from the trade union Unite, said the deal was a "welcome development". "My understanding of the deal, and what it means for Belfast, is the supply chain still seems to be what it is today, which would mean Belfast is integral to the overall process. "That should, we believe, increase and assure people's jobs down in the C-Series plan, but there are still further challenges." He said there were still some "concerns" over non-C-Series related contracts at Bombardier's Belfast plant, but the deal with Airbus should "allow for more orders to be placed" and help with long-term employment across the site. The union GMB said it was potentially good news but that the "devil was in the detail". "This deal is liable to further scrutiny from the US administration that may see it as an attempt to dodge their trade tariffs," said Ross Murdoch, GMB national officer. "GMB hopes both Bombardier and Airbus have taken cast iron legal advice to ensure they don't get rid on one legal challenge only to open themselves up to another." Bombardier was accused of anti-competitive practices by rival Boeing, which complained to the US authorities. Boeing accused the Canadian firm of selling the jets below cost price after taking state subsidies from Canada and the UK. The firm said the agreement with Airbus "looks like a questionable deal between two heavily state-subsidized competitors to skirt the recent findings of the US government". "Our position remains that everyone should play by the same rules for free and fair trade to work," it added. UK Business Secretary Greg Clark said the Airbus tie-up was a "positive step forward". Mr Clark said the UK and Canadian governments had been working to "safeguard jobs and manufacturing at Bombardier Shorts in Belfast, and the supply chain across the UK". The government was still pushing for a "swift resolution" to the Boeing dispute, he added. Arlene Foster, leader of Northern Ireland's Democratic Unionist Party, said she hoped the deal would "safeguard" the C-Series programme. "I'm thrilled there is a bright future ahead following what has been a dark time for staff and management," she added. Sinn Féin's Stormont leader Michelle O'Neill said the deal was a "good news story for Bombardier" that would "come as a relief to the workers and their families and all those local businesses involved in the Bombardier supply chain". Labour's Owen Smith, the shadow Northern Ireland secretary, said the deal "looked good for both Bombardier and Belfast". "Boeing's bullying has united its rivals and hopefully secured the jobs," he tweeted. The French government, which owns an 11% stake in Airbus, also welcomed the deal. 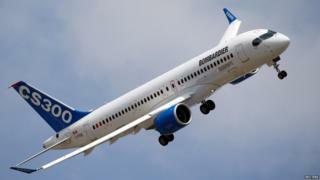 French Finance Minister Bruno Le Maire said it made Airbus and the European aircraft manufacturing industry "stronger".